Write an e-mail to with the short message "P + F = LOVE" and try your chance to win a dinner* at Restaurant LA TOURELLE in Stadtbredimus. *the draw for the 3 gift vouchers (unit value 150€) will take place on March 4, 2019. Please find the rules at the bottom of the page. One voucher per person. Valentine's Day without Crémant?! Not realistic! 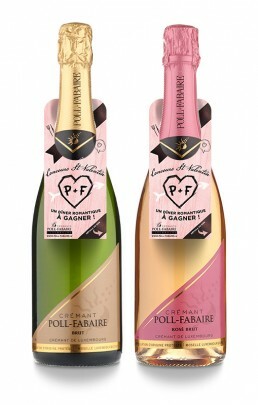 Our Crémant POLL-FABAIRE Brut & POLL-FABAIRE Brut Rosé are the perfect choice to say cheers to Love! POLL-FABAIRE Brut: This Crémant is round, flowing and flavourful with a pleasant balance thanks to a blend of different varieties: Auxerrois, for fruitiness, Pinot Blanc for freshness and finesse, and Riesling for body and power. It is often enjoyed as an apéritif and pairs well with finger food. POLL-FABAIRE Brut Rosé: A fresh Crémant with a fine, brilliant salmon colour. This Cuvée is composed of Pinot Blanc and Pinot Noir. In the nose you find aromas of red fruits, cherries and strawberries. This Crémant is aromatic, balanced and creamy. It is marked by its freshness but is at the same time very round.